While it was not too long ago in the scale of history, it feels like an extremely long time since video tapes had any kind of relevance around a decade ago, given the advancements that have occured to take its place in various markets. However, the presence of devices that can play them appear to remain fairly prominent regardless, according to a new study from TV Licencing in the UK. The survey (TeleScope 2013), made to primarily investigate the trends of TV and PVRs (Personal Video Recorders) in the region found that people in the UK currently have a cumulative 455m hours of TV content stored on their PVRs (primarily through brands such as Sky+ and YouView), an amount that would take close to 52,000 years to get through on its own. It was also discovered that in regards to the number of TV sets owned, figures from 10 years back may have reflected more of a ‘boom’ in owning multiple TV sets, as a household average of 2.3 sets in 2003 is down to 1.8 in 2013. However, it does not mean that less content is being seen, with the 2006 daily average of 3 hours and 36 minutes a day increased to 4h 2m this time around. The headlining statistic, however, is that while 47% of UK households have at least one PVR to record content on, 29% of all homes can still claim a VCR (video cassette recorder) as one of them, not as an obsolete attic-filler but as ‘part of their home entertainment set-up’. 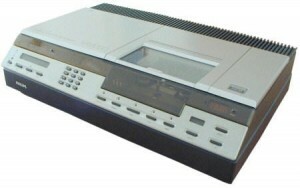 The facts prove to be a display of the home VHS industry (started in the region in 1978 through JVC (who ended their presence in VHS-only products in 2008) and soon added to through VCRs such as the one pictured (a Philips ‘Video 2000′ from 1982)) perhaps being in a slower decline than many people would have anticipated, joining CRT TV sets and black & white TV licences in keeping up a relatively ‘high minority’ around the world, despite advanced versions of each being widely available. In the TV product side of the study, it was noted by TV Licencing that close to a third of the UK’s ‘TV market value’ for 2012 came from 3DTV sets, while 5% of households now owned a smart TV (only 35% of which are actually connected). An additional insight attempted by the organisation was the ‘TeleHappiness Index’, which found comedy as the programming format that ‘brings most happiness’ to their viewer’s lives, with sport and drama/soaps also having good impacts on a majority of it’s audience’s cheerfulness. While a lot of the findings could have been predicted by many, perhaps a unique area of research could be to combine different areas of their research next time. Are TV viewers with a VCR happy with their ongoing decision, or is it recommended that they seek digital options on the path to enlightenment? Jeez you Brits are seriously behind the times. Do you still use steam powered vehicles as well? Hmmm do the brits still use steam locomotives as well?